Trinity Designs: It's Scrappy Monday! Hi everyone! I hope you had a great weekend - ours was busy, but fun. I was carried back to ancient Israel all day yesterday as we had our big dress rehearsal at church for the Easter Pageant presentation this coming weekend. It's always fun to act and sing in the production, but boy I had a hard time getting up this morning. Maybe it's the time change - since it was really 5:30 when I got up and not 6:30 like my alarm clock said! HaHa, I'm just not a morning person! Daylight Savings time is for the birds! 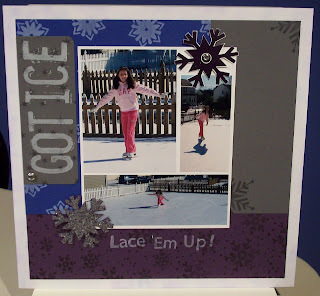 Today's posting is another layout that I did for my last month's Scrappin' Simplified class. I found the color scheme in a magazine and thought it would be perfect for pictures of my daughter ice skating in our backyard last winter. Yes, I said backyard! It was an amazing ice storm we had here then and she was even able to go over to the park and skate on the basketball court and tennis court. We took video of her and sent it into the local news and she was on the highlight reel that day! Very exciting. I still hadn't finished the journaling when I took the photos, but it goes in the open space on the Basic Gray block.